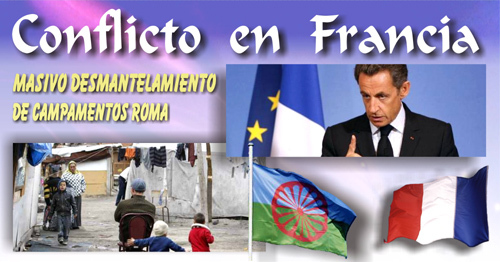 The decision by the French government to dismantle 200 nomadic community camps throughout the country, the majority belonging to Roma people, should not be tolerated by any civilized nation, institution or human being. The consequences are serious, especially for the Roma community but also for the stability and development of Europe in general. A recent report issued by the ‘Regions Committee’ entitled “The social and economic integration of the Roma”, indicates the milestones achieved by the EU with respect to the progress of Roma in Europe. In addition to this, it also highlights the way forward to meeting future challenges in a relatively new phase, which now covers an entire decade. (See document). There has been a successful commencement to the process whereby the European Commission has given priority in all its programs to ways of remediating differences in equality between the Roma community and the rest of society. It is evident therefore, that incidents like those which have recently taken place in France should not be tolerated as they hinder this important process for our people and also the work the European Union is doing. There are many different reasons why this should not be permitted, but to name a few, fundamental human rights are being breached, the possibility of living together peacefully has been reduced and for financial reasons we must take into account the enormous potential that encouraging millions of Gypsies into the production system would represent for the European economy. Commissioner László Andor, of Hungarian origin, also shares this belief about the economic boost which would represent their incorporation into the working world. He is also familiar with the social problems generated by the Roma community and the devastating social and political consequences that may result from situations similar to those now produced in France, and which are often prompted by political interests. Jobbik, the party which supports the "Hungarian Guard" (a neo-Nazi paramilitary organization unauthorized by the EU), which has succeeded in taking a political payoff to the "Gypsy problem" the country had in elections back in April of this year. Let’s hope that Nicolas Sarkozy does not become an example, as this would mean a significant step backwards in the current rule of law which the French state has always shown. The expulsion of two hundred nomadic settlements from France does nothing to solve the real issue that exists throughout Europe and the rest of the world, as this just "shifts" the problem from one place to another. The root cause of this issue has never been looked at in a broad, objective way. What is needed is an approach to the cultural essence of our people to be able to understand that it makes no sense to talk about a specific nationality or citizenship for nomadic communities, as for obvious reasons the very nature of these communities is nomadic. What is ultimately being denied is the right to a thousand-year-old lifestyle which forces them to remain in one place. Hasn´t anyone realised? The Roma community existed long before the vast majority of countries today and where these countries have been raising their borders, Roma movements have become restricted as laws and regulations "strangle" any movement. If we take account that this is common cultural heritage, the safeguarding and protection must also be common. It is therefore necessary to address the issue of a treaty that promotes a specific "International Roma Law" where legal principles are established to ensure the existence and mobility of nomadic communities. There should be provisions made in different areas that are conducive to free movement and right of access to state services and facilities wherever they may be. The United Nations should lead this joint project for the establishment of such a treaty that would protect against the current situation of helplessness experienced by nomadic communities. If this is not the case, the European Union, being the most affected, should at least establish such a treaty with all member countries which would avoid situations and conflicts like those in France, which would at the same time, facilitate the process of inclusion that is already underway. If some humanity can be found in the international institutions that vouch for the fundamental rights of individuals, there would seldom be a clearer case of vulnerability and urgent necessity for intervention to defend the rights of a group people with a history that spans a millenia. This is a peaceful group of people who continue to offer their rich culture and have never caused political or territorial conflicts like other smaller groups of people have done and continue to do so. (See news of the conflict in France).